UISegmentedControls have only four styles, each with preset heights and colors that you can’t change. How do you create a custom segmented control? Create a custom view that manages a button for each segment. Use a divider image to visually separate segments. 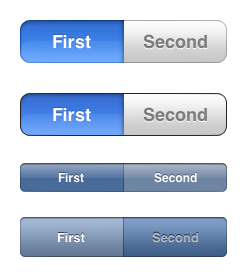 Use stretchable images to create nice looking buttons. Create fancier static images in Photoshop that are the exact width. Instead of having the implementation dictate one way, we’ll use a delegate callback so each instance of the custom control can decide how to build the buttons. The delegate also has optional callbacks to get notified when a touch up or touch down occurs on one of the segments. This will be were we takes actions like swapping out views when a user selects a segment. Any ideas or are you doing something thats 4.x specific? Love the site btw, some awesome stuff in here – kudos! Is there any way to set the selected segment in code? if I have two custom segmented control in a view, how can I recognize which segmented control call touchUpInside event when I touch one of them?